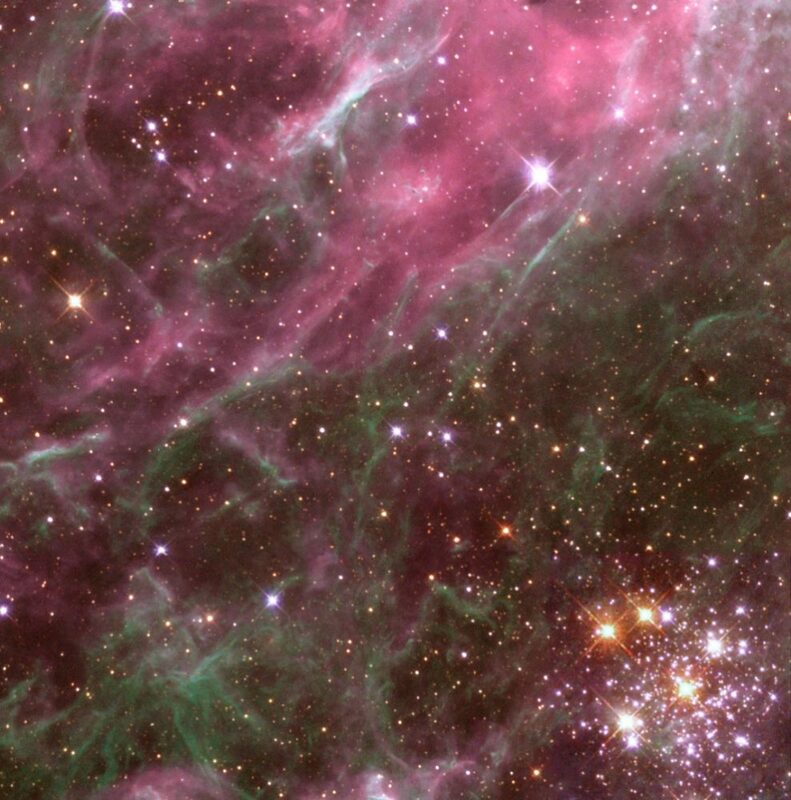 The Tarantula Nebula is a large emission nebula located in the southern constellation Dorado. The star-forming region lies within the Large Magellanic Cloud (LMC), a small satellite galaxy of the Milky Way and one of the nearest galaxies to our own, located on the border between Dorado and Mensa. 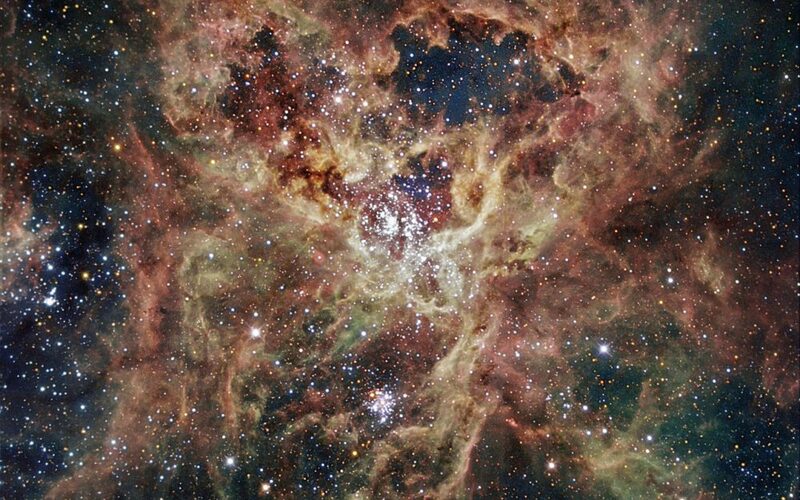 The nebula is also known as 30 Doradus. It has the designation NGC 2070 in the New General Catalogue. The Tarantula Nebula is one of the better known nebulae not listed in the Messier catalogue. It is the most active region of star formation known in the Local Group of galaxies, as well as one of the largest, spanning 600 light years, or 13 arc minutes across the sky. The nebula contains more than 800,000 stars and protostars. The newly formed stars are frequently hidden within clouds of dust and can only be seen in infrared wavelengths. The nebula is extremely luminous. It lies at a distance of 160,000 light years from Earth and has an apparent magnitude of 8. Because it lies so far to the south, it is visible primarily from southern latitudes. If it were as close to the solar system as the Orion Nebula, the Tarantula Nebula would be so bright that it would cast shadows. The Orion Nebula, while more famous, especially in the northern hemisphere, is only a hundredth the size of 30 Doradus. The Tarantula Nebula got its name because its glowing filaments of dust resemble the legs of a spider. It is a giant starburst region where the energy from the bright, hot young stars creates huge voids and filaments in the surrounding clouds of gas. 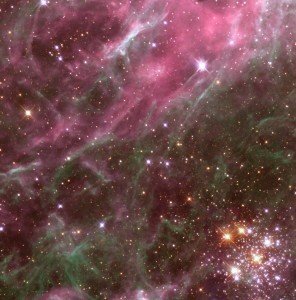 The Tarantula Nebula contains two clusters. The compact cluster R136 is responsible for most of the energy that illuminates the nebula, and by extension for the nebula’s visibility. R136 contains several extremely huge stars, roughly 100 times the mass of the Sun. The cluster has an estimated mass of 450,000 solar masses and a diameter of 35 light years. It will likely eventually become a globular cluster, a group of old stars orbiting the centre of the Large Magellanic Cloud. Hodge 301, the other star cluster in NGC 2070, is older, with an estimated age of 20 to 25 million years. It is almost 10 times older than R136. 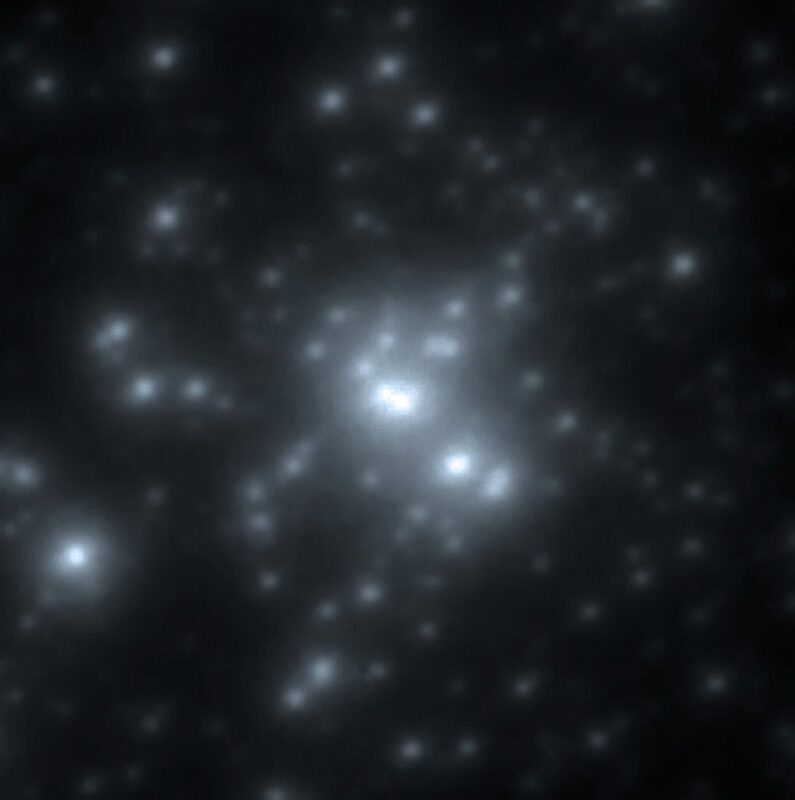 Hodge 301 contains a number of brilliant massive stars. The cluster’s most massive stars have already ended their life in supernova explosions. Three red supergiants found in the cluster are also expected to explode in the near future, relatively speaking. The exploded stars in Hodge 301 are sending material into the surrounding nebula at speeds approaching 200 miles per second. As the Tarantula Nebula contains the nearest super-cluster of stars, it is an object of study for astronomers studying the starburst activity that was more common in the earlier stages of the universe. The nebula’s environment resembles the extreme conditions of the early universe in terms of dust content, metallicity, and rate of star formation. 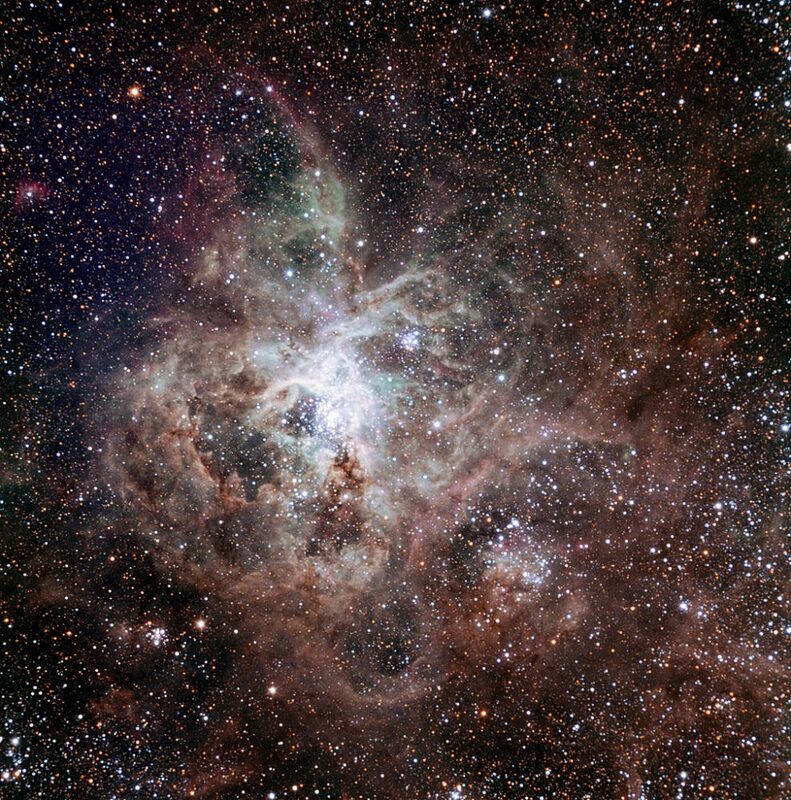 The Tarantula Nebula is located at the eastern end of the stellar bar in the Large Magellanic Cloud, which contains a number of similar regions, but none of them quite and bright and large as the Tarantula. 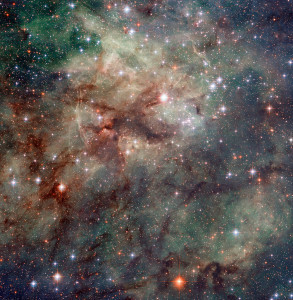 30 Doradus is an excellent example of an H-II region, a starburst region in which hydrogen gas is ionized by photons from the embedded stars. The main sources of the nebula’s light are the hot, young blue supergiants embedded within the nebula’s central core. 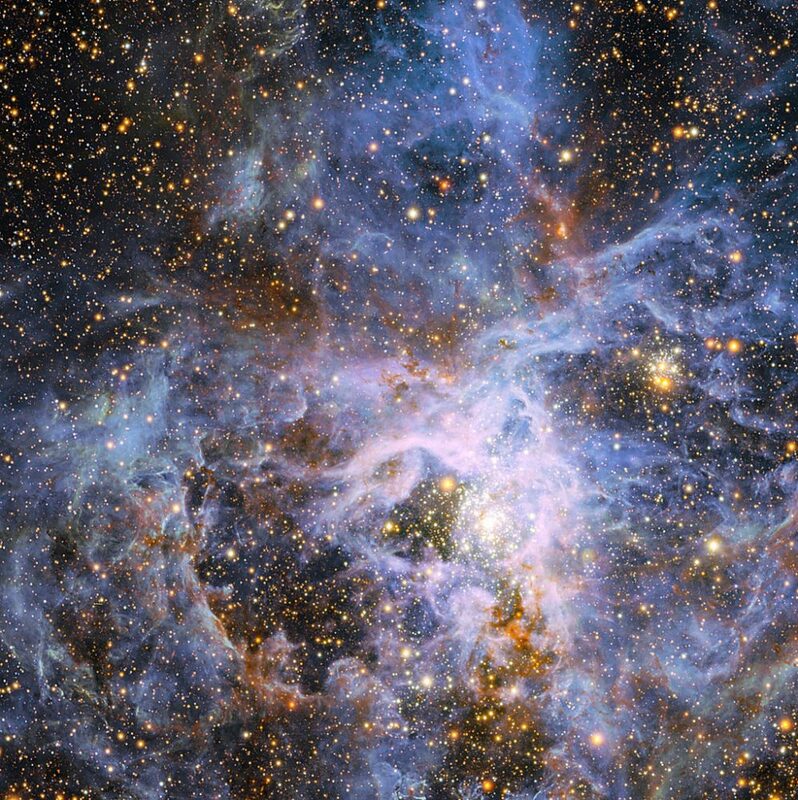 The Tarantula Nebula is producing hundreds of thousands of stars, which is significantly more than most nebulae. 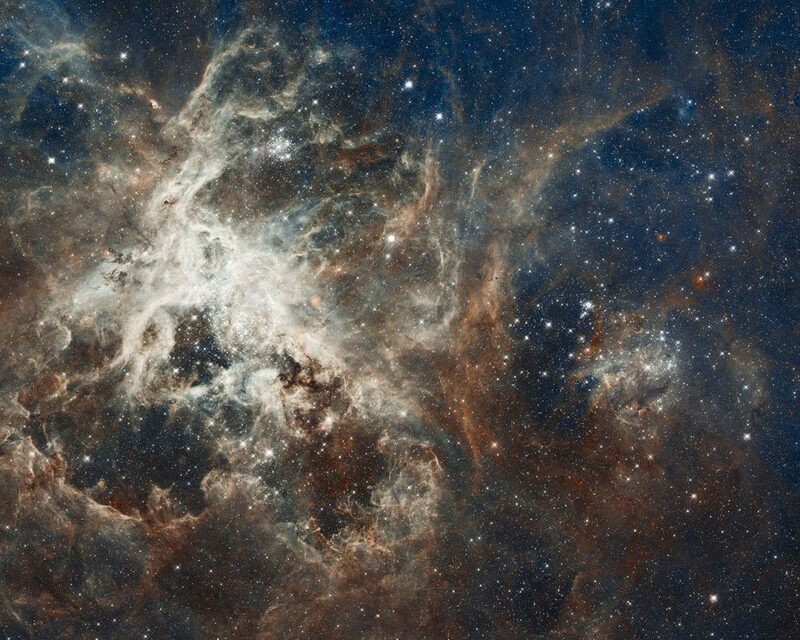 The Tarantula Nebula was originally thought to be a star. In 1751, the French astronomer Nicolas Louis de Lacaille was the first to recognize its nebular nature. 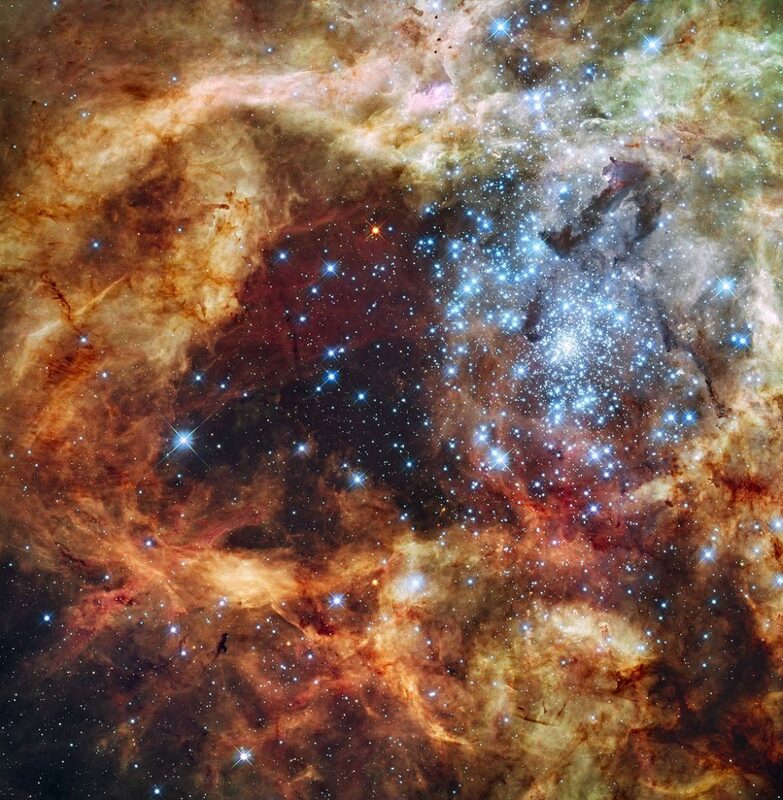 30 Doradus was the site of the closest supernova seen since the invention of the telescope. 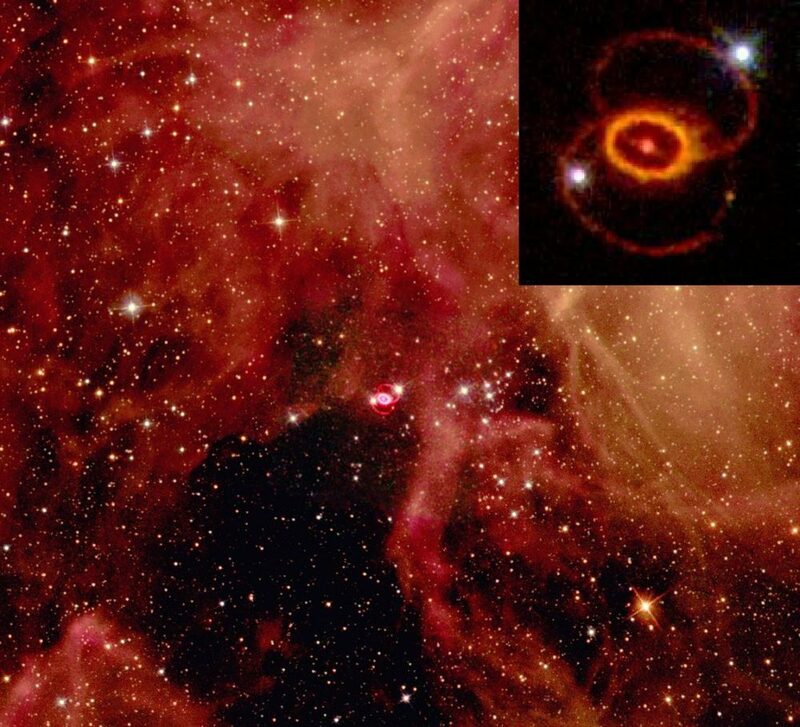 In 1987, the Supernova 1987A (SN 1987A) was observed in the nebula’s outer regions, approximately 168,000 light years from Earth. 1987A supernova remnant near the center. 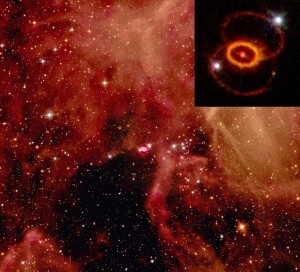 Composite of two public domain NASA images taken from the Hubble Space Telescope. First image: Dr. Christopher Burrows, ESA/STScI and NASA; Second image: Hubble Heritage team. The supernova was discovered in late February and reached a peak apparent magnitude of about 3 in May before its brightness declined in the following months. Stars that end their life in such explosions generally only live for a few million years and don’t travel far from the site where they were formed. 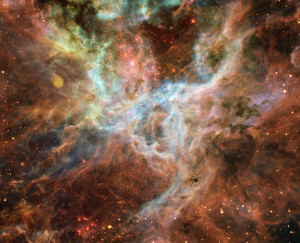 Starburst activity in the Tarantula Nebula started tens of millions of years ago. The star forming regions will likely merge into larger star clusters in the future. Some of the fuel for the star birth activity may come from the gas stripped from the Small Magellanic Cloud, a nearby dwarf galaxy, located in the constellation Tucana. 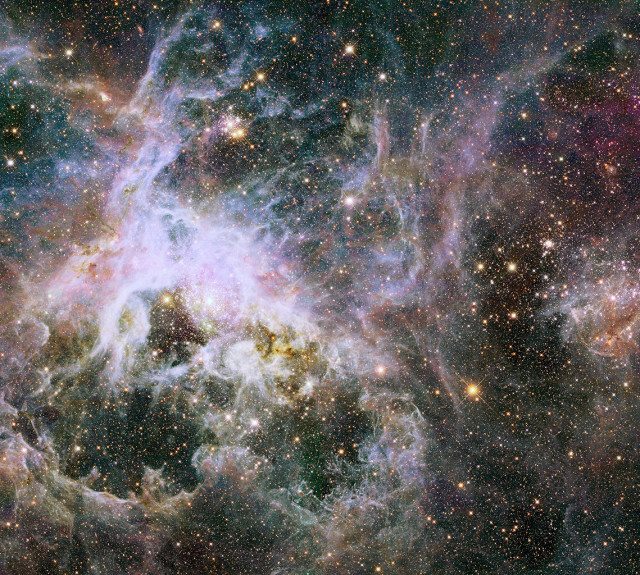 The central region of the Tarantula Nebula contains thousands of massive stars which are blasting away material and generating intense radiation as well as strong stellar winds. These winds and the supernova explosions in the region heat up the gas to millions of degrees. The star R136a1, a member of the R136 super star cluster, is one of the most massive and luminous stars known. It has a mass 265 times that of the Sun and is 8.7 million times more luminous. The star has 35.4 times the Sun’s radius and an estimated surface temperature of 53,000 K. R136a1 is a Wolf-Rayet star, an evolved, massive, extremely hot star which is rapidly losing mass as a result of a strong stellar wind. About 30 pc to the northeast of the R136 cluster, astronomers found another extremely massive, luminous Wolf-Rayet star. VFTS 682 has a mass about 150 times that of the Sun and a radius 22 times solar. The star lies at a distance of 164,000 light years from Earth. It has a visual magnitude of 16.08 and belongs to the spectral class WN5h. VFTS 682 is 3.2 million times more luminous than the Sun and has an estimated surface temperature of 52,200 K.
The star is isolated, but has a near identical twin in one of the massive stars in the centre of the R136 cluster. NGC 2060 is another interesting object in the Tarantula Nebula. It is the remnant of a supernova that occurred in the Large Magellanic Cloud some 5,000 years ago. 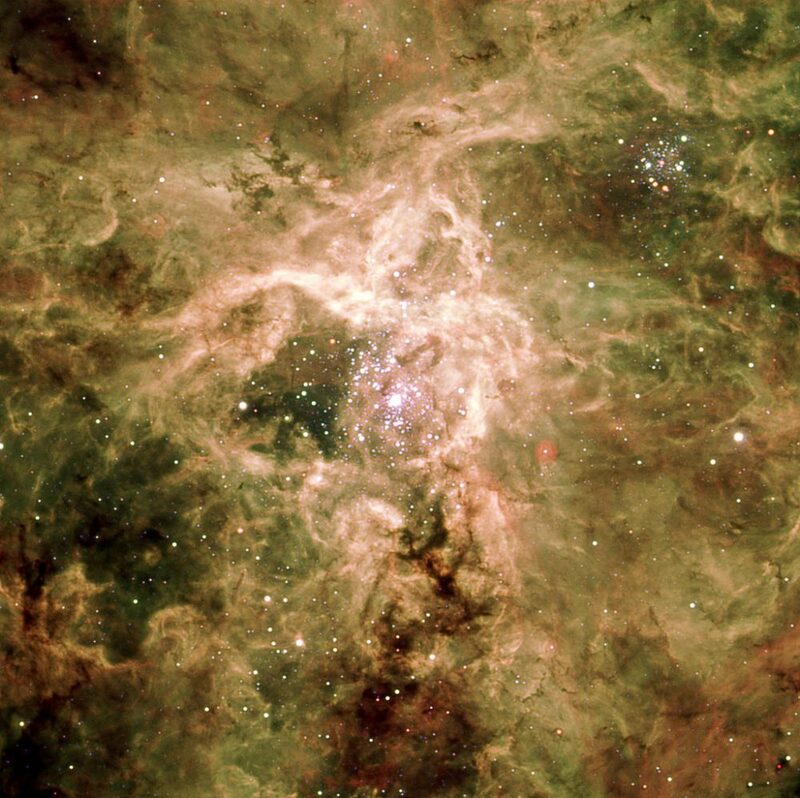 The designation NGC 2060 is also used for the associated star cluster. The supernova remnant was discovered by the English astronomer John Herschel in 1836. In 1998, a pulsar was discovered inside NGC 2060, and given the designation PSR J0537-6910. The pulsar has a rotational period of 18 ms.
Multimillion-degree gas detected in X-rays (blue) by the Chandra X-ray Observatory comes from shock fronts — similar to sonic booms –formed by these stellar winds and by supernova explosions. This hot gas carves out gigantic bubbles in the surrounding cooler gas and dust shown here in infrared emission from the Spitzer Space Telescope (orange). 30 Doradus is also known as an HII (pronounced “H-two”) region, created when the radiation from hot, young stars strips away the electrons from neutral hydrogen atoms (HI) to form clouds of ionized hydrogen (HII). It is the most massive and largest HII region in the Local Group of galaxies, which contains the Milky Way, Andromeda and about 30 other smaller galaxies including the two Magellanic Clouds. Because of its proximity and size, 30 Doradus is an excellent target for studying the effects of massive stars on the evolution of an HII region. 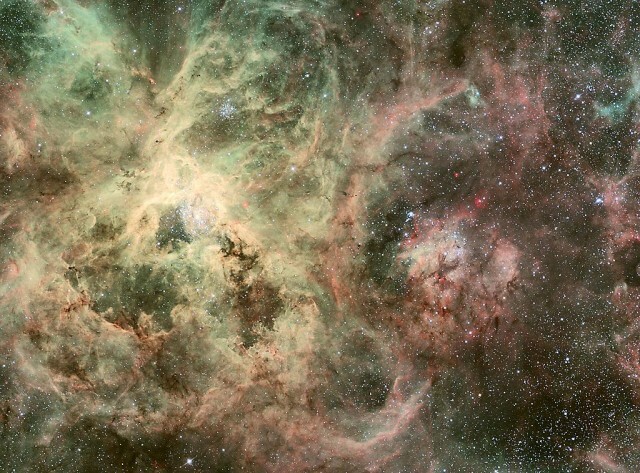 The Tarantula Nebula is expanding, and researchers have recently published two studies that attempt to determine what drives this growth. The most recent study concluded that the evolution and the large-scale structure of 30 Doradus is determined by the bubbles of hot, X-ray bright gas confined by surrounding gas, and that pressure from radiation generated by massive stars does not currently play an important role in shaping the overall structure. 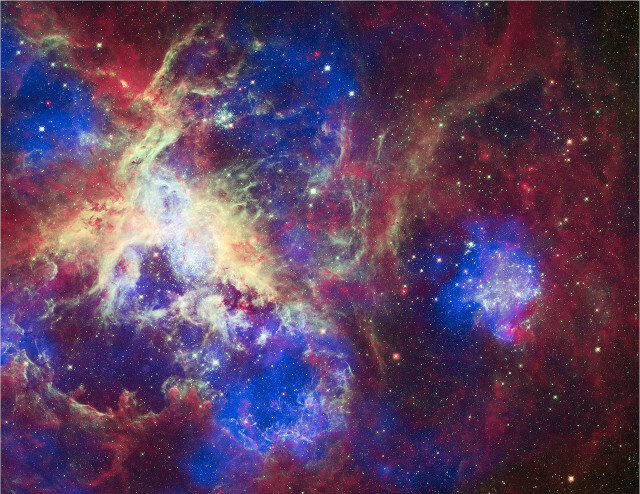 A study published earlier in 2011 came to the opposite conclusion and argued that radiation pressure is more important than pressure from hot gas in driving the evolution of 30 Doradus, especially in the central regions near the massive stars. 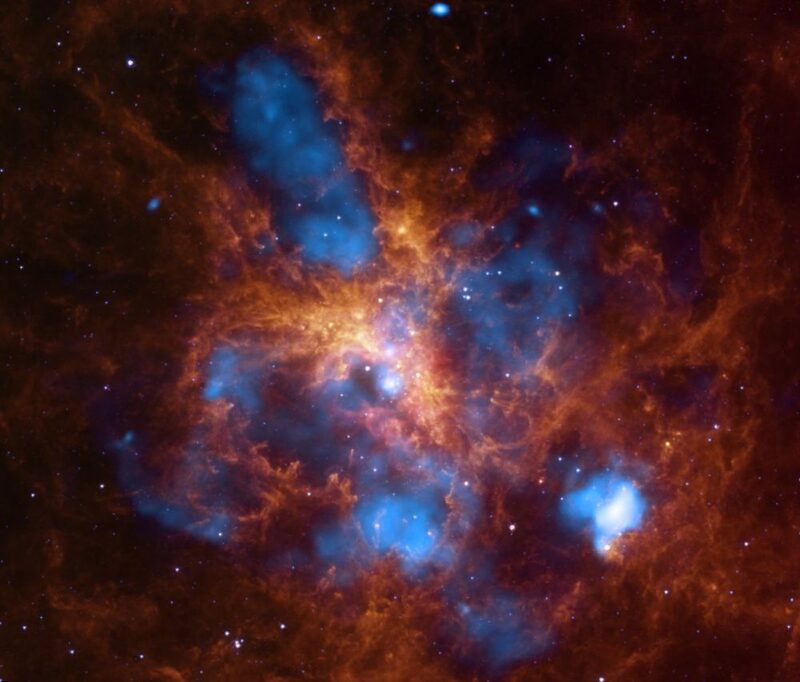 More detailed analysis and deeper Chandra observations of 30 Doradus may help decide between these different ideas. Image: X-ray: NASA/CXC/PSU/L. Townsley et al. ; Infrared: NASA/JPL/PSU/L. Townsley et al. 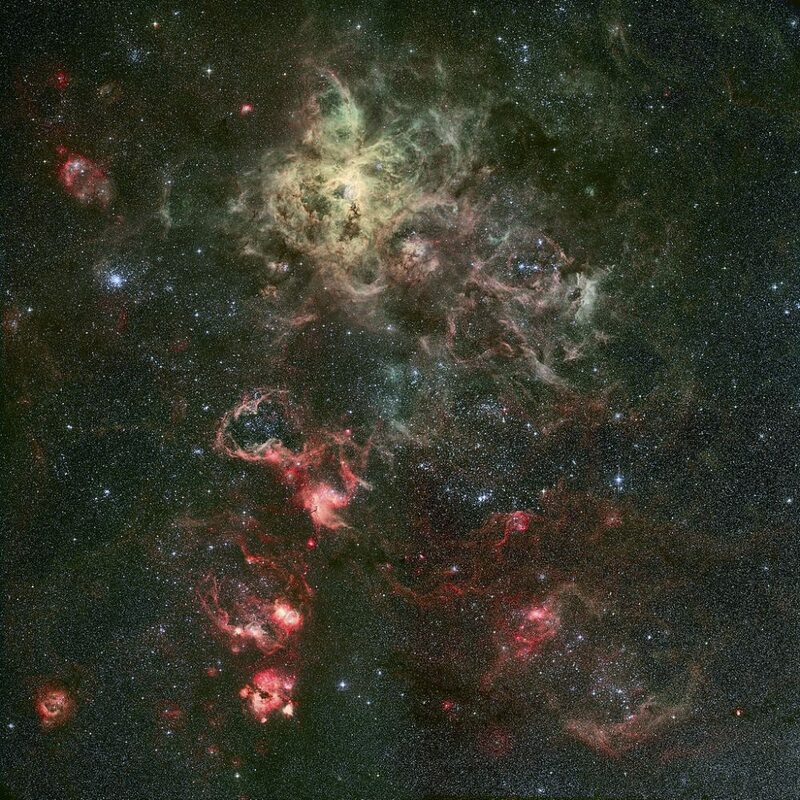 Three-color image of the Tarantula Nebula in the Large Magellanic Cloud. The image is based on observations made on 10 February 2002 and 22 March 2003 with the FORS1 multi-mode instrument on ESO’s Very Large Telescope in three different narrow-band filters (centred on 485 nm, 503 nm, and 657 nm), for a total exposure time slightly above 3 minutes only. The data were extracted from the ESO Science Archive and processed by Henri Boffin (ESO).